Finally! That’s the least you can say about the availability of Lefthand OS 12.0. Why? Well there are some features that were announced quite some time ago and which become finally available. Space Reclamation – StoreVirtual Storage can now reclaim space in VMware vSphere and Microsoft Windows environments using T10 UNMAP. 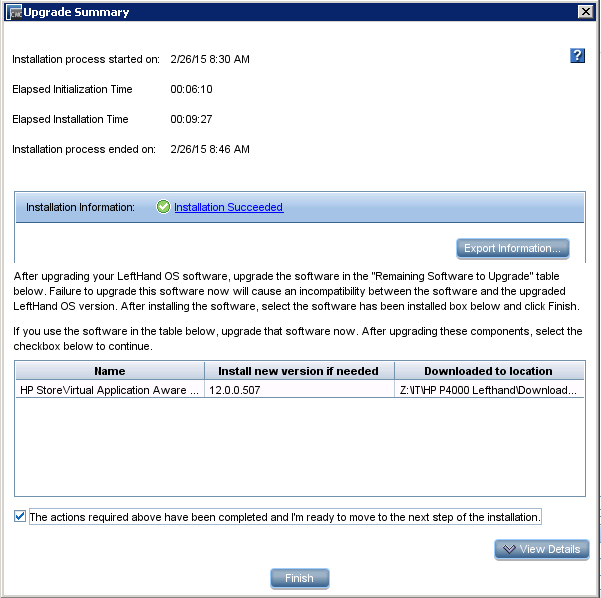 HP StoreVirtual Multipathing Extension Module (MEM) for VMware vSphere – Reduce latency and improve performance in VMware vSphere environments. The MEM also optimizes data-path traffic in multi-site (or stretch-cluster) configurations. New REST API – Provision storage, create and modify storage pools using the all new web services based API for HP StoreVirtual. Faster remote copy performance and system reboot times. Second is the MPIO extension for VMware. Windows had a performance advantage because of the MPIO DSM for Windows. This features gives the knowledge of where the blocks of data reside (on which node) directly to the host… Result: more iSCSI connections and so a better performance. Now this feature is also available on VMware environments. After the update of the CMC Centralized Management Console to 12.0 (next, next, next, finish) you will get the message that the storage systems in your MG Management Group needs to be updated. This is an automated process where every node will be updated 1 at the time so that your volumes remain online (if you have quorum of course – majority of managers). In my case (2 nodes and 1 FOM Failover Manager) took somewhere around 10 minutes. A quick check proves that my VSA is updated to 12.0. Now that my storage systems are updated let’s check out the new MPIO support for VMware. First let’s take a quick look on my current situation: 1 Lefthand volume connected to 4 ESXi 5.5 servers. Path selection is currently Round Robin. First we need to install the new MEM on my VMware servers. This can be done through VMware Update Manager and via CLI (SSH). Everything is well explained in the HP StoreVirtual Storage Multipathing Deployment Guide that can be downloaded together with the 12.0 software bits. You see clearly that the GateWay connections for server ESX3 (where I installed the VIB to make these pictures) is changed to HP MPIO control. In an upcoming post I will extend the LH SAN with a 3rd VSA, which will show at that moment that I will have more connections per VSA in my cluster.